The Events screen displays all the events registered by devices assigned to the user’s account. The Events can be sorted in ascending or descending order using any column of values by clicking on the column field name, that functions as a sort order toggle button, that sorts all events in either ascending or descending order using the key values of that column. The column positions can be easily re-ordered by using the left or right chevron icons that appear when the column header is hovered on. Keep in mind that the chevron icons are constantly visible in mobile screen sizes or touch devices. The field value sorts all the events in either ascending or descending order using the values of this column. Also, when hovering the two chevron icons appear that allow column re-ordering. Hovering the mouse cursor over an event, highlights the whole row and column to help users pinpoint values with ease. Hovering the mouse cursor over an Event highlights row and column. Using various Filters, users can narrow down the number of displayed events only to the ones that are of interest. The time range filter is a date & time picker component that enables you to see events within the selected date and/or time range. 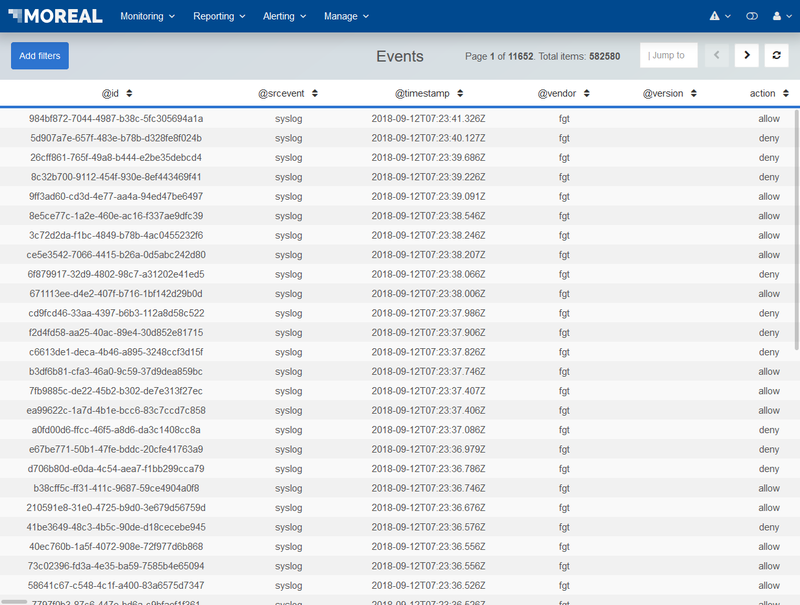 The device multi-select filtering component that allows you to select which devices you want to see event logs from. The fields multi-select filtering component that allows users to remove fields they are not interested in so that they are not presented in the events listing. The event type-drop-down select list that filters events based on the event type. 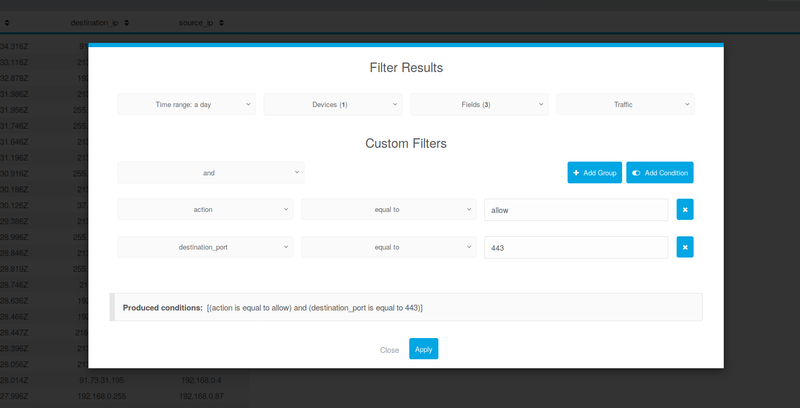 Below the filter results section is the Custom filter section, that allows users to write expressions to filter events that contain specific values. Keep in mind that the Apply custom filters button has to be pressed to submit the Custom filters. 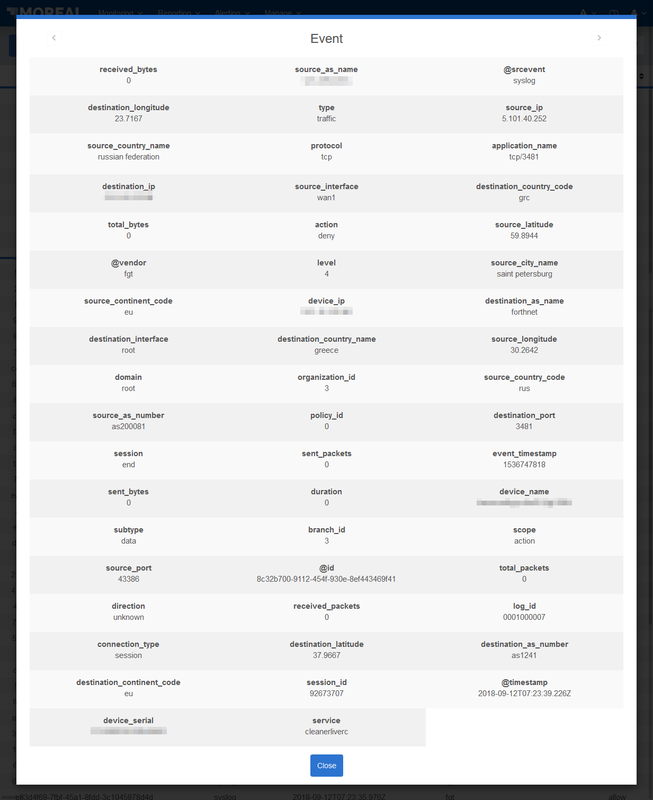 Depending on the screen size of the device you are using to access the MOREAL platform and the number of fields shown, users might have to scroll horizontally to see all content. When clicking on an Event row a modal window pops up that contains every value of every field for that specific event. You can easily move between events by using the chevron icons located at the top of each event modal.